A renewed diversion has come upon me! While working to get as much Korean into my head, I took to watching Korean dramas every night. At first, it was an exercise purely to be fully immersed in Korean for as much as possible. Alas, I am hooked. I went from watching “My Princess” to “Boys over Flower” and got them on Netflix of all places! Upon first watch, all I noticed was make-up, plastic surgery and confusion that all the actors look the same. I was amused and irritated that the boys all looked so feminine and prettier than some of the girls on the shows. And THEN, like Stockholm syndrome, the more I watched these videos and dramas, the more beautiful the men (ahem, boys) began to look to me. So, of course, I HAD to Google the beautiful men. 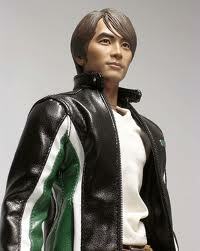 From the gazillion pictures, videos, blogs and websites dedicated to all things KPop and Korean dramas, I came upon this photograph of a doll of Song Seung Hun. Asian enough? Isn’t it amazing that no one in the United States can make an Asian doll look Asian? American Girl dolls have a pathetic rendition of a Chinese girl. I think we need to rethink our imports. The idea that in an alterate universe I could have him as my Ken doll? Crazy. and my daughter and I share a wicked crush on Kim Namgil of Queen Seondok….